biosyn is a world leader in the manufacture of high quality, clinical / GMP and research grade hemocyanin products (IMMUCOTHEL® and VACMUNE® liquid) derived from the hemolymph of the sea snail, Meghathura crenulata, also commonly known as the Giant Keyhole Limpet. The hemocyanin derived from this snail is widely known as Keyhole Limpet Hemocyanin, in short KLH. The most frequent variant of KLH consists of 20 subunits that form two connected rings (didecamers) with a molecular weight of about 8 million Dalton. The dissociated subunits of KLH form the immunocyanin with a molecular weight of about 400 KiloDalton. If one administers immunocyanin to patients, this results in the body's confrontation with hundreds of xenogenic epitopes of this molecule and triggers the activation of the patient's immune system. The protein structures of the immunocyanins induce increased activation or synthetization of T-helper cells, cytotoxic T-suppressor cells, IFN-α, IFN-γ, IL-1a, and IL-2, macrophages and NK cells are stimulated. 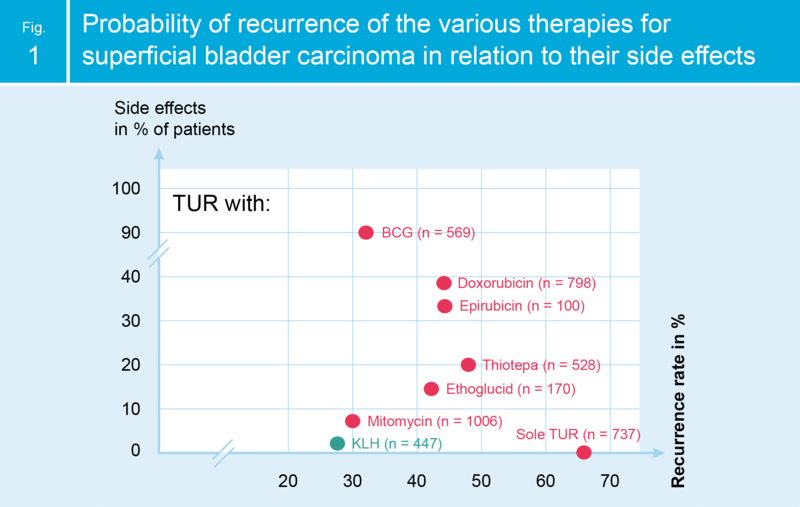 For patients with superficial urinary bladder carcinoma, the recurrence-free interval is signi cantly (≥ 100%) extended by KLH (IMMUCOTHEL®) (Fig. 1). Bladder cancer is the second most common malignancy of the urogenital tract and the fourth most common type of cancer in men. The standard treatment for preventing post-TUR recurrences has been instillation therapy with cytostatics and/or the immunotherapeutic agent BCG. Both are associated with good efficacy, but also with certain side effects. The availability of BCG is currently limited. IMMUCOTHEL® is a well-tolerated and efficacious immunotherapeutic agent for instillation therapy to prevent recurrences of superficial bladder cancer. Its benefits lie in the fact that its efficacy is equipotent to chemo- or immunotherapy with BCG but has markedly fewer side effects.